Apologies to Mrjones_83, who I accused of driving into the back of ExtremelyFastMan in the early stage of SRW Sunday Race-Off 29A after making a braking mistake, but the reality was that Peppinho has drove/lagged into him first and that unsettled his car, which then smashed into the back of ExtremelyFastMan. Mrjones_83 braked very safely there and is not to blame. The 29th version of the Simraceway Sunday Race-Offs featured two great cars, the Bentley Speed 8 versus the Mclaren F1 LM, both known for performing with an excellent way, in their respective classes. Of course, the legendary Silverstone track was meant to be a tough challenge for both cars to overcome. Even from the pre-qualifying stage, it was obvious that the battles were going to be spectacular, despite the fact that the Bentley’s prototype had a better pace than the Mclaren’s sports car. Fourteen of the best drivers in Simraceway were ready to take on the challenge around Silverstone, in an epic race that noone would ever forget. Seven drivers raced with the Le Mans winning car in 2003, the Bentley prototype, and the other seven participated in the sports car that was built in honor of the overall 1995 Le Mans winner Mclaren F1 GTR, the Mclaren F1 LM. As the sun was shining, the racers were taking their grid spots, with acerockolla sitting on pole in his Bentley. Alongside him was Shadowbounty, while Axfitey and Launger completed the second row of the grid. Fastest in a Mclaren F1 LM was AGO6, who was closely followed by vanPanther, pilotapazzo and CrazyBuzzy during the Qualifying session. Five red lights were ready to go green and launch another magnificent Simraceway Sunday Race-Off multicar event, an endurance race lasting for 30 laps. The start was very clean, although there were three Bentleys which fell to back of the grid and had to quickly make their way forward again. Mr_Jones83 and ExtremelyFastMan spun in turn 2, but it was Launger who was forced to spin in turn 3, after an incident with Peppinho. Acerockolla and AGO6 took advantage of their poles and both led the first lap in their respective classes. Laps 2 and 3 were full of Mclaren F1 LM action, as the fight for the last podium spot in class (and tenth overall) was on. Johndaniels saw pilotapazzo filling his mirrors with the characteristic bright yellow color of his Mclaren, but John defended his position with great passion, although he was given a penalty for blocking CrazyBuzzy’s move earlier. This was obviously an appetizer, right before the main dish which was just arriving, as the battle for the overall lead in the Bentleys was heating up. Shadowbounty took the lead from acerockolla, but acerockolla managed to regain it at lap 5, right before they approach the slower field of the Mclaren F1 LM cars. Meanwhile, Axfitey was joining the battle and the pit stops were just starting, with AG06 pitting from the F1 LM class lead. The first third of the race was completed (10 out of 30 laps) and the lead trio of acerockolla, Shadowbounty and Axfitey were still close to each other and more pit stops were happening behind them. This race was shaping up to be very interesting, especially with the pit strategy being expected to play an important role to the result. In the meantime, all the three leaders made their first stop on the same lap (lap 11). Drama almost came for Shadowbounty, right before he joined the pits, because vanPanther spun his Mclaren F1 LM right in front of Shadowbounty’s Bentley; Shadowbounty did a good job of missing that wreck. Axfitey won the race off pit road, but he was awarded a drive-through penalty and had to come back around in the pits. But it was the driver Launger, who had pitted very early, took advantage of his innovative strategy and found himself in the lead, after the first cycle of pit stops was completed. Halfway through the race, sikham received the lead in the Mclaren F1 LM class, after the mix of strategies there. However, he needed to pit, so CrazyBuzzy inherited the class lead. In the meantime, Axfitey had a close call, while he was trying to lap Johndaniels, as Johndaniels didn’t leave enough room on the inside and contact was made. Fortunately, both continued their race unscathed. Despite his drive-through, Axfitey was still in second place, chasing Launger and he got really close when slower traffic was approached by both of those Sunday Race-Off stars. The dark was starting to fall and two thirds of the race were being completed. 10 laps to go, headlights are being turned on and the question now becomes if the lead duo have enough fuel to stay ahead of the charging acerockolla and the rest of the previous race leaders. Launger pits with 10 laps to go and Axfitey receives the overall race lead. Behind him, acerockolla, Shadowbounty and Peppinho are chasing him hard. But it is proved that almost no one is good on fuel, as they all pit together with 9 laps to go, except for Axfitey and acerockolla who are still staying out. Mclaren F1 LM class leader is sikham once again, as CrazyBuzzy completes his stop. Sikham is now 3 laps down to the overall race leading Bentley, but has a steady advantage over the second place of CrazyBuzzy. With 8 laps to go, Axfitey and acerockolla both pit. Axfitey surprisingly comes out of the pits leading the race and his advantage over Launger seems to be stable. Mr_Jones83 jumps to third position, after acerockolla’s stop. Peppinho rounds up the top five. The wonderful Silverstone sunset was something to look at, due to the opportunity needed to take a break from all of this on-track action. As everyone is looking back at the action, only 5 laps are remaining for the end of this awesome race. Everything will be judged in the end. Axfitey absolutely nailed the strategy and mastered it. He is now very close to the win and surely, his pitting strategy will prove to be the key for the expected victory. And it all changes rapidly in the Mclaren F1 LM class, because CrazyBuzzy is the new leader, pilotapazzo goes second and sikham falls down to third. Obviously, sikham needed to pit for fuel. Only two laps to go for the leaders now, gap is coming down between the two leaders in the Bentley class and overall. Launger’s pace seems to be a little better than Axfitey’s in those closing laps. They both enter the final lap, they are both very experienced in the top level of Simraceway’s events. Axfitey certainly has the skill to maintain a three seconds gap like this, but Launger is very quick in the closing stages of this race. However, Axfitey’s Bentley Speed 8 sees the checkered flag first, with his headlights being brighter than ever due to his joy, under Silverstone’s night falling. He played the strategy game with the best possible way. Launger comes home second and acerockolla climbs to the third and final place of the podium, as ExtremelyFastMan and Shadowbounty battle it out to the line for fourth place. ExtremelyFastMan wins that battle by half a car length over Shadowbounty; they were both approaching slower traffic in the start-finish line. Mr_Jones83 brings his Bentley in sixth position. But behind him, there are the Mclaren F1 LM cars. CrazyBuzzy wins the class and finishes seventh overall, sikham overtakes pilotapazzo in the end, as they finish second and third in the Mclaren F1 LM class respectively. Certainly, it was a very interesting race, as expected. Big congratulations to everyone who took part in it. Whether it is the drivers, the Simraceway TV crew, the commentator or the live marshalls, they all deserve it, as they brought an exciting pack of simracing action up to surface once again. Stay tuned for the next Simraceway Sunday Race-Off live events and make your way up to the top! Good luck! The 29th version of the Simraceway Sunday Race-Offs featured two great cars, the Bentley Speed 8 versus the Mclaren F1 LM, both known for performing with an excellent way, in their respective classes. Thank you for preparing this fantastic report. We have highligted this in one of the latest Blog posts, which you can see below. 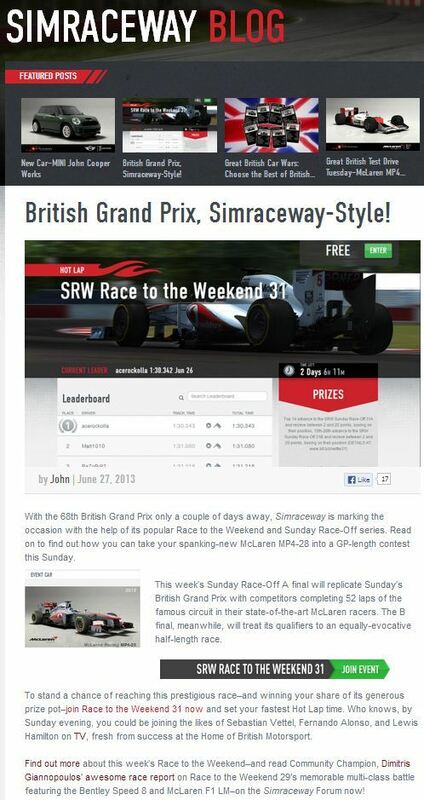 Also, you are now officially the Simraceway Race Reporter Looking forward to more of these! And it all changes rapidly in the Mclaren F1 LM class, because CrazyBuzzy is the new leader, pilotapazzo goes second and sikham falls down to third. Obviously, sikham needed to pit for fuel. Results of all Sunday Race-Off 29 events are announced at the bottom of the main post and all prizes awarded for Sunday Race-Off 29B and 29A paid out and in your accounts.